I haven't really shared that much about my life prior to adventure racing. Sure, there's a brief bio on the obligatory "About Me" page, but nothing really that in depth. Well one thing you should know about me is I grew up riding horses. 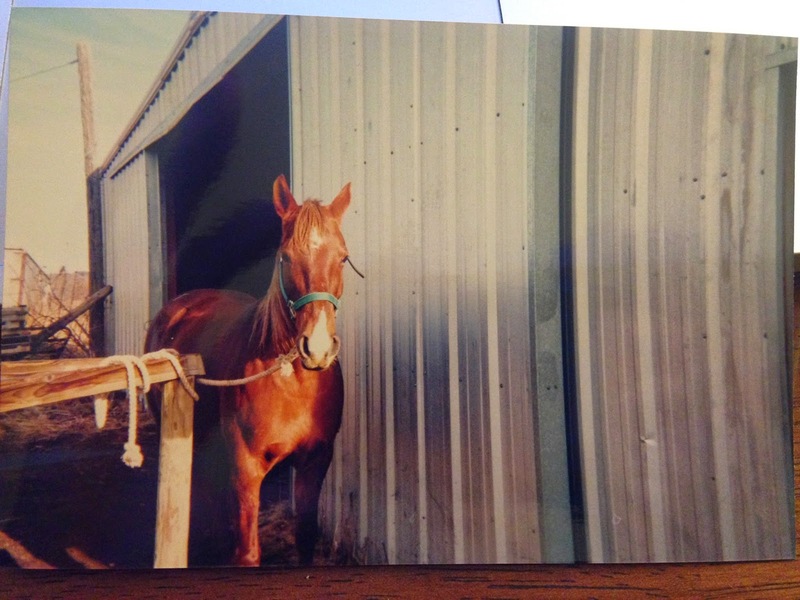 From about 4th or 5th grade until senior year of high school, I was a full-on horse addict (and honestly, still am). I worked at a horse barn in exchange for riding lessons, and after a few years of that my parents bought me my very own horse. Her name was (is!) Flyer and she was (is!) one of the biggest influences on my life growing up. I have TONS of Flyer stories since I spent about every waking, non-school, and non-soccer minute at the barn, but the main thing that's relevant here is she was (is!) opinionated. Stubborn, you might say. And her ears, while certainly within a normal horsey size range, were (are!) a bit large. So on her bad days, of which there were plenty, she got called a mule quite a bit. When I found out there was an adventure race called Stubborn Mule, I HAD to do it. Had. To. 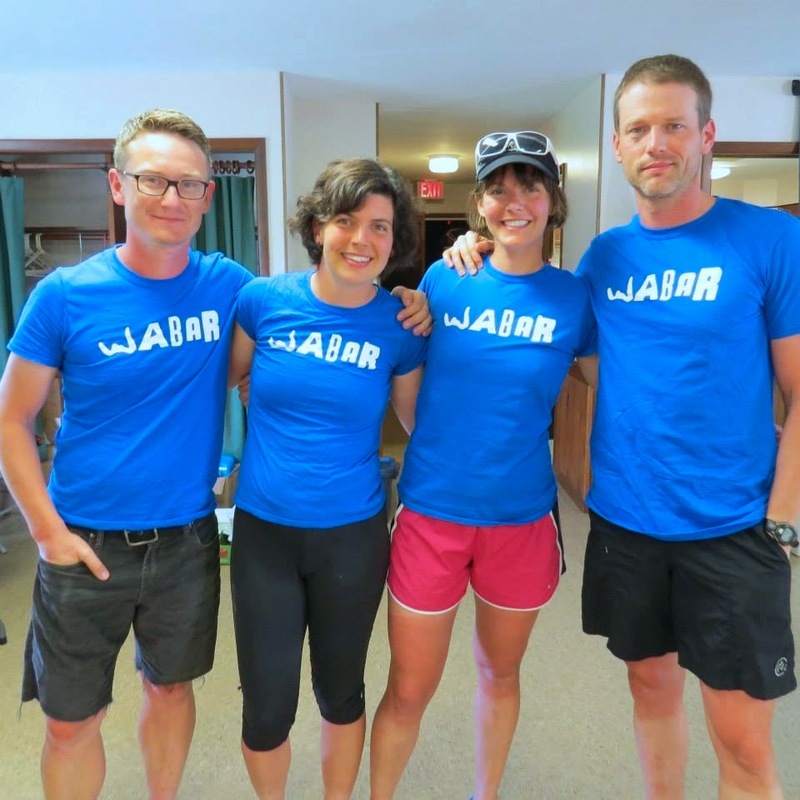 It took me a couple years to get the right combination of teammates and vacation time (the race is in northern Wisconsin, a big drive from STL) sorted, but when WABAR came together, we decided we needed a prep race before Cowboy Tough. A 30hr? 2 weeks out from the big dance? Perfect. Stubborn Mule, here we come! Me, Rachel, Mike, Andrei before the race. Rachel drove up to STL on Friday and we carpooled north though Illinois and Wisconsin, stopping only for gas and pizza. 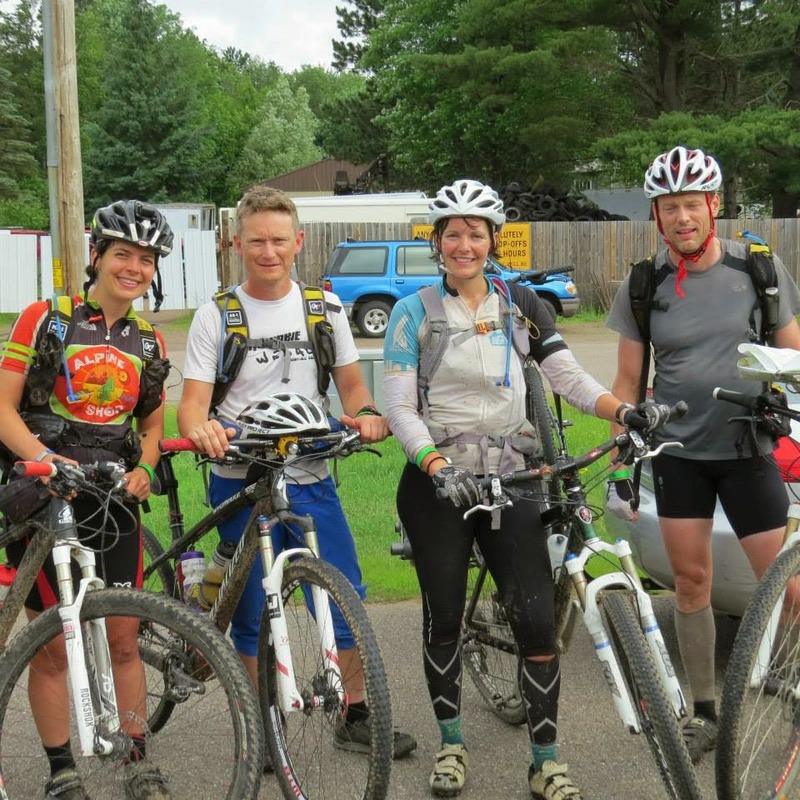 Andrei met us in Tomahawk, a town close to the Race HQ, and shortly afterwards Mike rolled in from Indy. 180 Adventure, led by Race Director Paula, doesn't have ANY pre-race activities on Friday night so we just spent time catching up and getting our gear ready. Race morning was EARLY, somewhere in the 0300s, because we had to leave the hotel by about 4am to make it to Race HQ by 0430 for map distribution. Once we got to Lake Nokomis City Hall, it was all-hands-on-deck to get the maps plotted and prepped. Rachel called the first batch of UTMs for Mike to plot while Andrei and I got bikes ready. Then I sat in for Rachel as she went to the pre-race meeting. We barely had everything plotted, much less routes planned, when race staff came through calling everyone to the start at 0600. Ah! We were all feeling frantic, rushed, and with NO IDEA what our next 30 hours looked like, but that's just the name of the game adventure racing. We did our best to remember what had and hadn't been accomplished with our bikes, and prepared for an opening trek. Just before the race started at Lake Nokomis City Hall. Garrison and I still frantically reviewing the map. Paula gathers everyone for a group photo and then starts the race. Even once she says "GO! ", Mike and Andrei take a couple extra seconds to double check our route before running down the road. The majority of the field is ahead of us, but we know that keeping our heads on straight is worth the extra time at the beginning of a 30hr race. 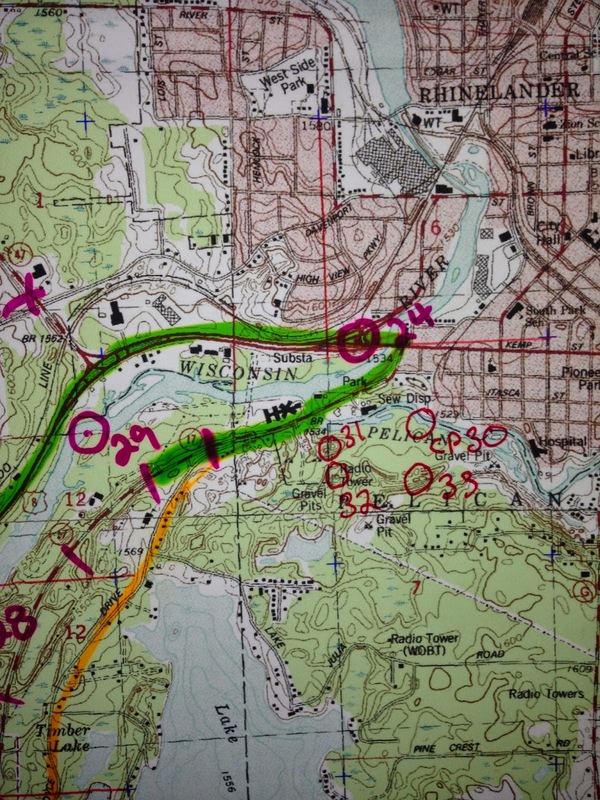 With our route decided, we check off the road run and then dive into the Wisconsin woods for the first CP. After the nasty woods of Plot, Pedal, Paddle last weekend, this vegetation is positively divine. Relatively open, no briars, and the pine branches feel like puppy kisses! We all exclaim in delight at their friendliness. We attack the first two CPs with a crowd of teams, and it takes a bit for Mike to get fully into the map, but once we are rolling then the middle two CPs come easily. The final two CPs are on the Hiawatha Trail, a converted rail bed (i.e. rails-to-trails, i.e. flat and open), so we ramp up the pace and immediately start sweating buckets - it's humid up here! 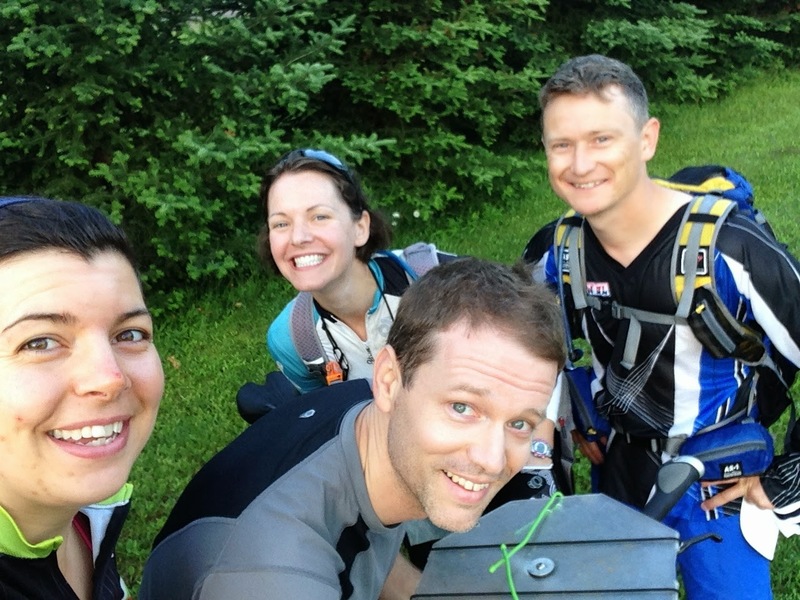 Andrei, me, Mike, Rachel running on the Hiawatha Trail. We run back into Race HQ/Start Line/Finish Line/TA1 and turn in our completed map. Turns out we are in 2nd place in the 30hr race, about 10 minutes behind ENDRacing/Yogaslackers. Despite being behind, we have several things to accomplish in TA that didn't get done before the race started - tows attached to bikes, extra air in tires, maps properly folded, etc. It takes us another 10 minutes to get out of there, but again it's time well spent to set us up for a productive race. Biking from Race HQ to TA2. Once we've finally got out bikes sorted, we pedal out of Race HQ/Start Line/Finish Line/TA1 and onto the backroads of northern Wisconsin. There are a couple CPs on the way, and one short stint on a sandy ATV trail, but the rest is smooth and fast pavement riding. We keep the pace uptempo to try and close the gap to ENDRacing/Yogaslackers. There are a few other 12hr teams in front of us as well, some that we pass, and some that we don't. Mike keeps the nav super clean and pretty soon we're rolling into TA2 at Treehaven, a forest preserve operated by UWSP. ENDRacing/Yogaslackers are just leaving TA, and we are happy that their gap hasn't grown! 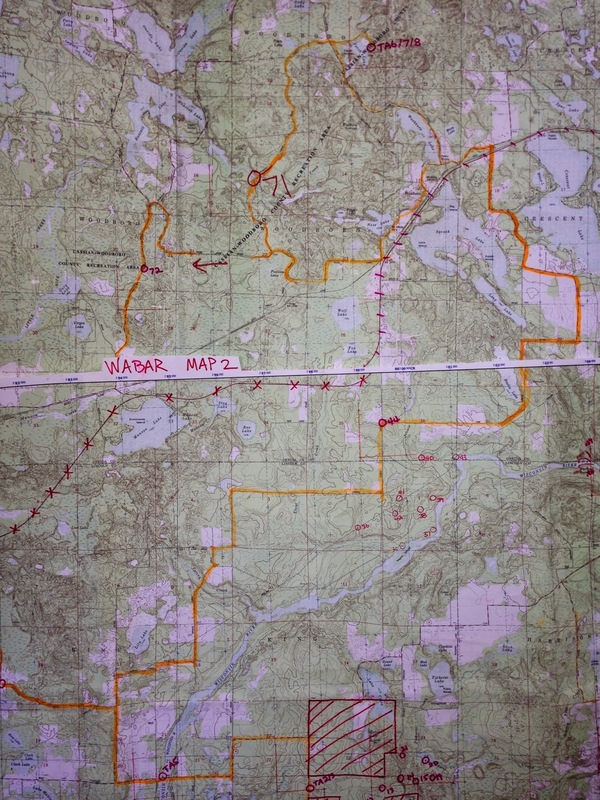 This trek has 12 CPs we can get in any order, along with a few prominent chunks of Private Property to avoid. Andrei and Mike settle on a route (roughly clockwise) and we run off down a wide multi-use trail. 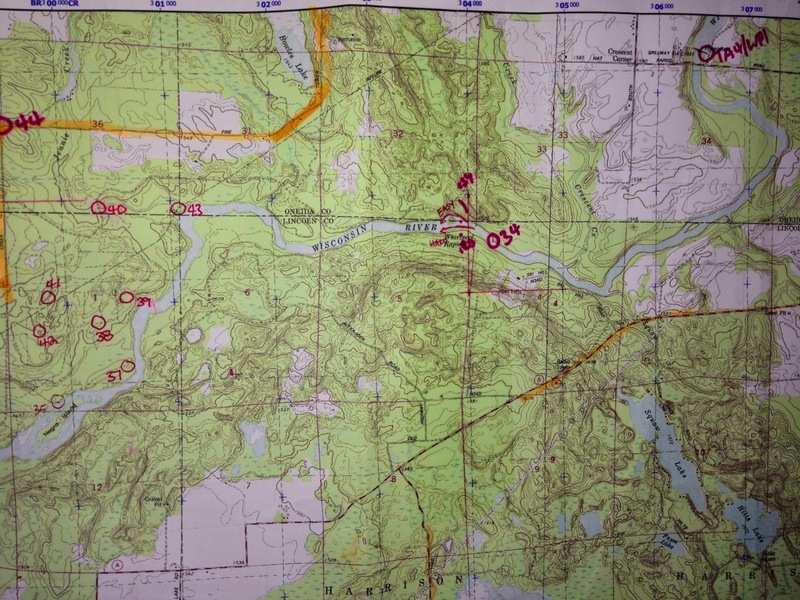 There is an entire network of trails throughout this area, most of which are NOT on our USGS map. But, there are wayfinding signs at almost every junction so we use a few of those to double-check our location. The terrain here is fairly subtle and Mike is doing a killer job with the nav. We are hitting pretty much everything straight on, communicating well on the all-punches, and running the grassy trails when we can. Things get a little interesting after CP17, where we have to run down to the road to avoid PP on the way to CP11. The ground turns to marsh and then there's a stream, which Mike discovers is wadable even after you slide down its muddy bank! We all keep our packs dry as we wade belly-deep across the chilly stream, emerging refreshed and even more stoked on Wisconsin terrain. On the road run we see our friend Phil (aka Silent Chaser, racing solo) tackling the loop in the opposite direction and share intel that the stream is crossable. Then it's back into the woods for CPs 11, 10, and 12 and the remaining jog to TA. We're all feeling really great about our trek and turns out we are the first team back to TA! 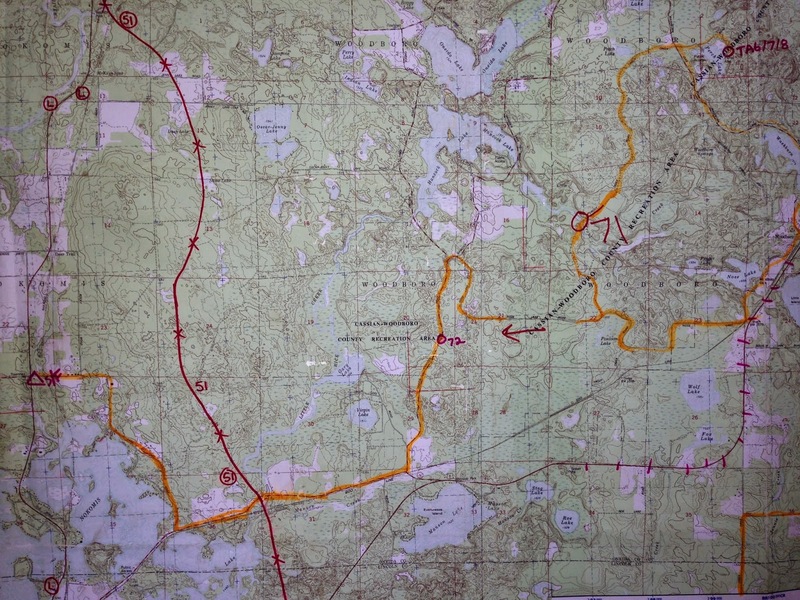 From TA3 (lower left corner) up thru Rhinelander (upper right corner) and then back down to TA4 (middle of map). 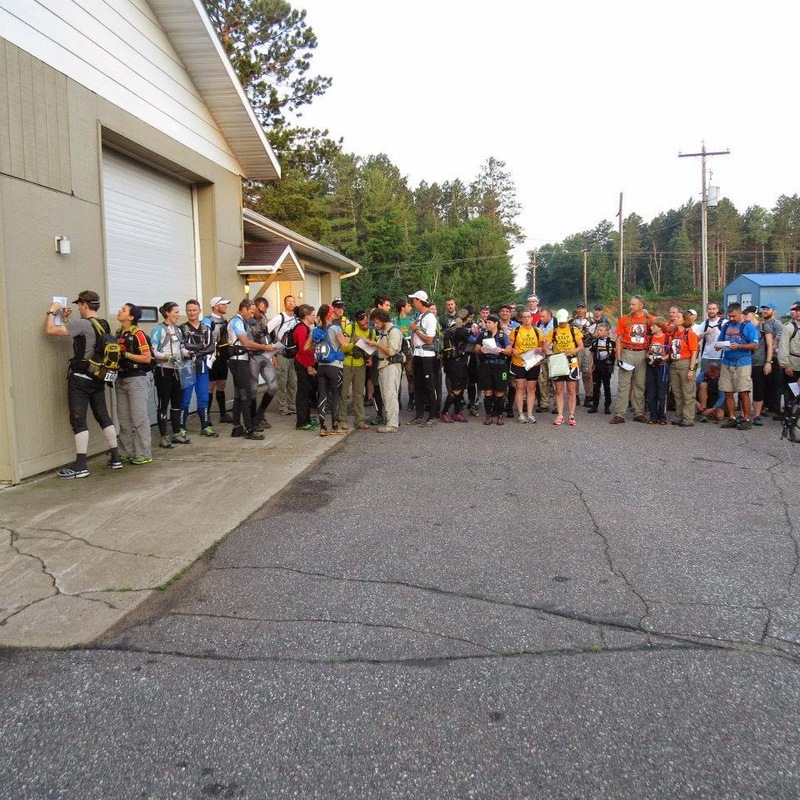 Now we've got a large-ish bike leg that will take us north, through the town of Rhinelander, and then back south to the paddle put-in. The nav is straight-forward, the roads are paved, and the headwind is manageable by working together in a paceline. 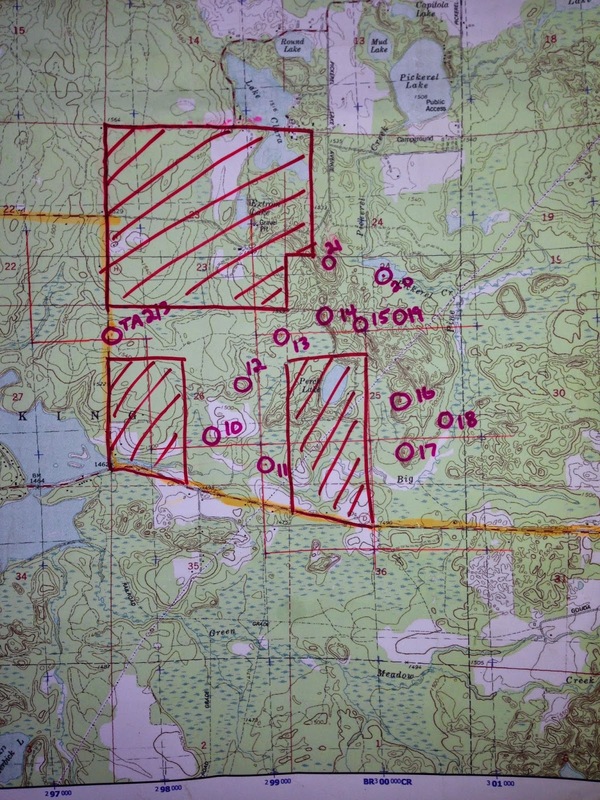 There are a few "question" CPs which are not orienteering flags and punches, but questions that we must answer to prove that we visited each location. Race Directors do this sort of stuff when CPs are in public areas to prevent flag theft. The questions are all obvious and we have no trouble answering them. Once we get to Rhinelander, the nav becomes confusing for a minute since there is a major bridge not shown (probably built after the map was made) but we know our general direction to find a statue of Rhinelander's mascot, the mythical Hodag, and count its teeth for CP24. From there we ride along the western bank of the Wisconsin River, all the way to Hat Dam. We roll into the TA to find it hopping with 12hr teams, but we are the first 30hr team to arriv! Hoo-ray! The race staff give us a map for some additional CPs at the northern end of the paddle, PLUS a special challenge...BIKE POLO! 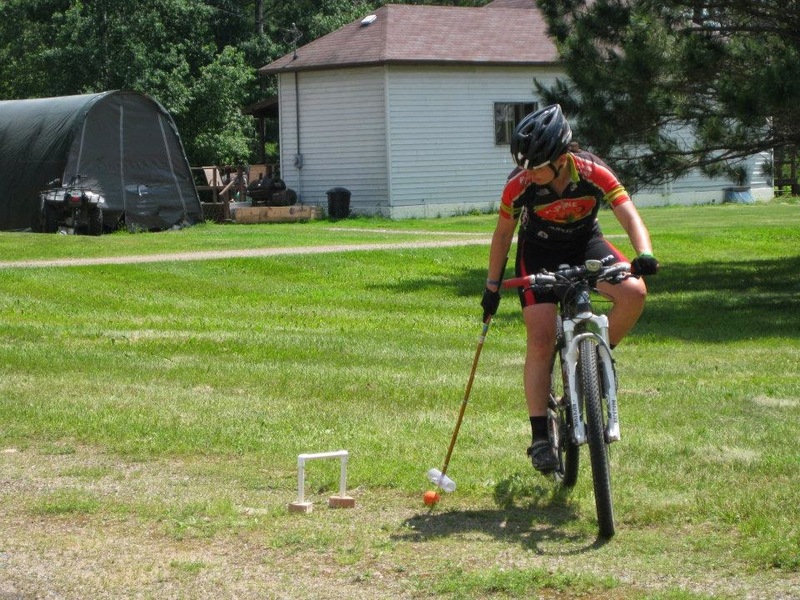 Or rather, bike croquet. When races are going well, as this one is, I LOVE special challenges and immediately volunteer. We have to guide a ball through a croquet course without "dabbing" or knocking the wickets over, and are given a 10min time limit. I knock the ball around for my required 10min, making it through 6 out of the 10 wickets, and without dabbing once! 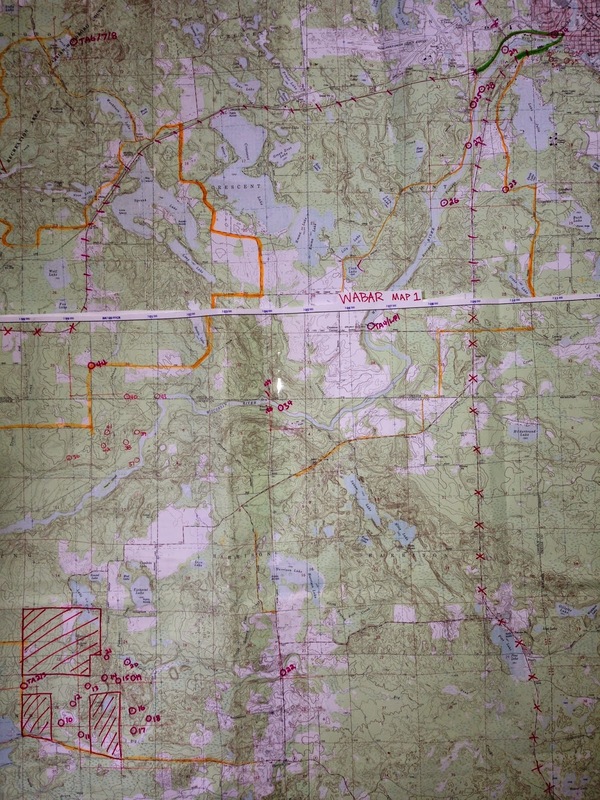 In the meantime, Andrei, Rachel, and Mike have been prepping maps and canoes, so once I'm done I help portage everything up the dam to the river for put-in. We discover a brisk tailwind at our backs for the upstream paddle to Rhinelander. It's a bit of a conundrum - paddling upstream usually means sticking close to shore to avoid the current, but to take advantage of the tailwind we want to be in the main channel. We decide to stay in the middle of the river since it's pretty easy going there. I'm in the front of Mike's boat, and Andrei is in the front of Rachel's. She is still getting used to steering with a double-blade paddle, but after a few kilometers they get the hang of it and we all cruise upriver. I'm doing the nav and we arrive at the inlet for CP26 earlier than I thought as it seems like the tailwind is helping us a lot. We answer the question for CP26 and then continue to nab 27-29 cleanly. Then we have a decision to make - where to take-out for the mini-trek? I decide to take us all the way to CP30, which is the obvious take-out spot, but in hindsight not really the most efficient. We beach the canoes in a small clearing and take several extra minutes in transition. I declare that we're "luxury racing" since we spend time putting bug spray on, hiding bottles of Coke in the river to chill for our return, and generally faffing about before setting off into the woods. The next 4 CPs are a short-n-sweet trek which we attack clockwise. 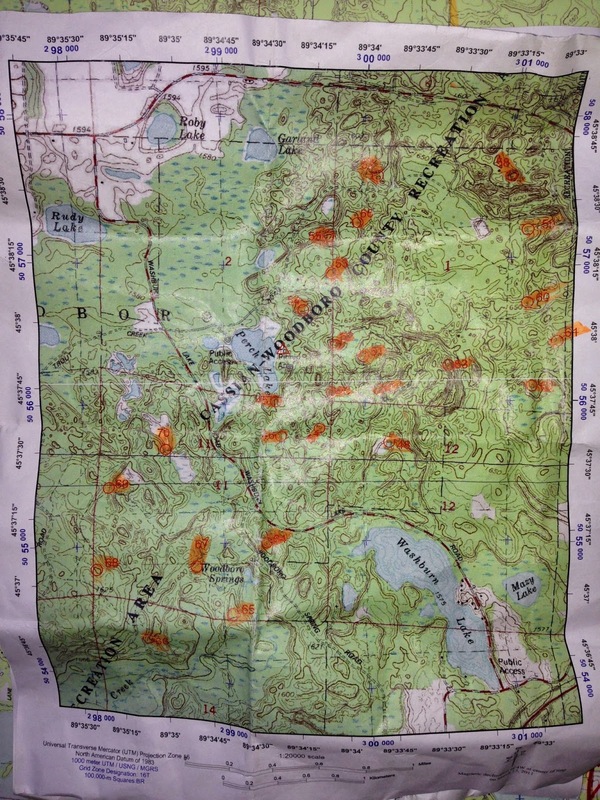 The terrain here is immensely interesting and intricate, way more than the USGS contours show, and we all speculate out loud it would be a terrific place for an orienteering sprint. In all of our dilly-dallying at the take-out, we decided against wearing pants and it's the best feeling ever, getting to run through the open woods without fear of getting slashed to death by briars! We return to our boats in high spirits, greeting by cold-ish Cokes from the river and Gatorades from our paddle bag. I love adventure racing! 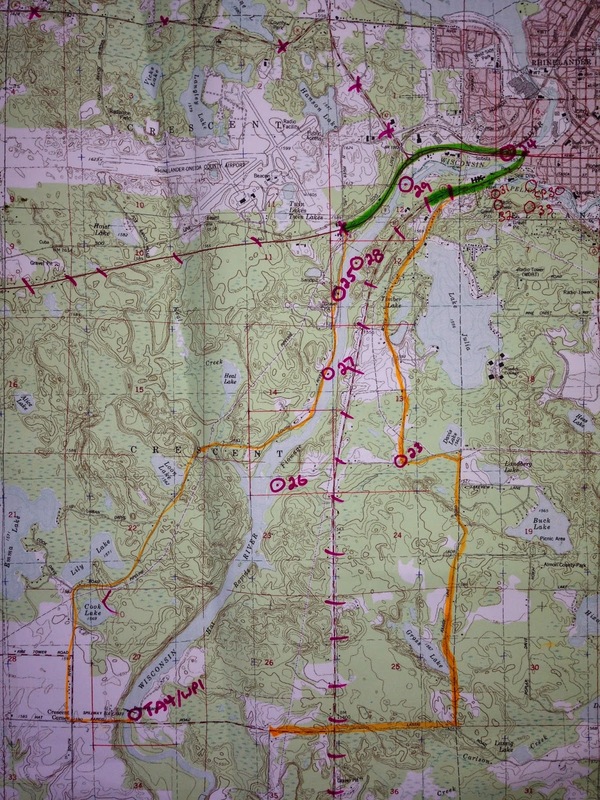 Paddle downstream from CP30 to TA4, then portage over dam. Refreshed and rejuvenated, we get back in the boats for the return trip down the Wisconsin River. Not long after we start paddling again, we see three people running silently on the shoreline - it's Rib Mountain Racing, still trekking but likely not all that far behind us. Luxury racing goes out the window as we focus on paddling strong! The wind is gusting in our faces, but we still opt for the main channel to try and wring any advantage that we can out of the downstream current. We also see ENDRacing/Yogaslackers paddling upstream so we know that we've got to keep the pressure on if we want to maintain our lead. Rachel and Andrei are working really well together and our boats are about equal speed, which will be fantastic for Cowboy Tough. Pretty soon, the Hat Dam appears in front of us and we portage everything up and over the spillway, put back in below the dam, and continue paddling. We put in somewhere around 5pm, and the remaining paddle is one of the most enjoyable I have ever experienced, hands down. The downstream current sweeps us along gently, the sun is just easing into the golden hour, and the river is absolutely beautiful with alternating trees and marshy reeds lining the banks. There are enough rocks and riffles to keep the paddling interesting, and we just generally enjoy ourselves on the way to CP34. Shortly after 34, there is a section of Class II/III rapids that we've been warned about and are grateful to hit in the daylight. The direct route is Class III and the around-route is Class II, and we all agree that the around-route, aka "the easy route", is the way to go. Both boats make it through just fine and we continue on the unbelievably scenic Wisconsin River to CP35. I can't emphasize how much I enjoyed this section of the race - it was definitely my favorite! Another teams' boats and gear at CP35. We beached the canoes at CP35 and ran CCW. We hit the unmanned take-out with a decent amount of daylight and are excited to knock out some CPs without headlamps. 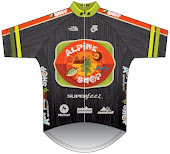 We hustle through transition, not knowing if Rib Mountain or ENDRacing/Yogaslackers have made up any time on us. We go roughly counter-clockwise on this loop, dealing with trails that magically appear and disappear through the thicker (but still largely briar-free!!) woods. CPs 37, 38, and 39 go well enough, but on the way to CP43 we are confronted with a huge clear-cut area with discarded logs everywhere. It's open but really difficult travel (very easy to slip down through the logs and wrench a knee). We make our way carefully through the clear-cut and see our friend Phil again at CP43. It appears he beached early to pick up these two northern CPs and then will continue paddling. Smart! We have to cross more clear-cut on the way to CP41, 42 goes well, and then we have a bugger of a time with CP36. There are trails and actual roads winding through this area, but they aren't mapped so we decide to attack off the contour features instead, bypassing a very obvious trail from the gasline maintenance building. It's just barely light enough to see without headlamps as we bash southward in the bottom of the shallow reentrant. We're scared of overshooting the flag in the thick undergrowth so the going is very slow. We have a couple false alarms where the terrain seems to match exactly as it should with no flag, so we continue making our way slowly down the reentrant. And then we re-encounter the gasline maintenance building trail, and the CP36 hung neatly on the side of it. Blast! We just lost a bunch of time bushwhacking when a trail run would have taken 5 minutes. But it's our last CP of this leg so we can regroup as we run back to the canoes. On the way we spot Rib Mountain Racing, as well as a solo racer wearing a full mosquito suit so he looks like a bear. Back at the canoes, we're not sure if Rib Mountain went clockwise or counterclockwise, so they could be right behind us! We throw everything in the boats, attach our glowsticks, and get moving. Paddling from CP35 to TA7/take-out. There aren't any CPs on this paddle and only one potential tricky nav junction, so we turn our lights off and paddle mostly in the dark, just listening for any rapids. On a few occasions we mis-judge the riverbanks and run into reed beds, but they're easy enough to correct. The wind is still gusting around and we feel it especially on the final few kilometers into TA7. But by then we're almost done and it's easy to stay motivated when we see the volunteers' glowsticks at the final take-out. Is this not a beautiful river?!?! Granted, at this point in the race it was dark, but just loooooook! Our bikes have been transported here by race staff so we get set to go. It seems to take us FOREVER to pack up up our paddle bag, get everyone's lights sorted, extra food either consumed or thrown out, maps marked up and properly folded, etc. But we finally roll out without a Rib Mountain sighting so we are feeling okay about our lead. The ride to TA8 is straightforward and mostly northbound, meaning we have a generous tailwind to push us along. The ride absolutely flies by and before I know it we're pulling into Perch Lake (I thought the signs said Peach Lake for the longest time) to get ready for the next two legs. TA 8/9 is a beautiful park structure with an indoor space and attached pavilion. Just as we go inside, we hear a rushing of wind and a crashing of rain. Downpour! 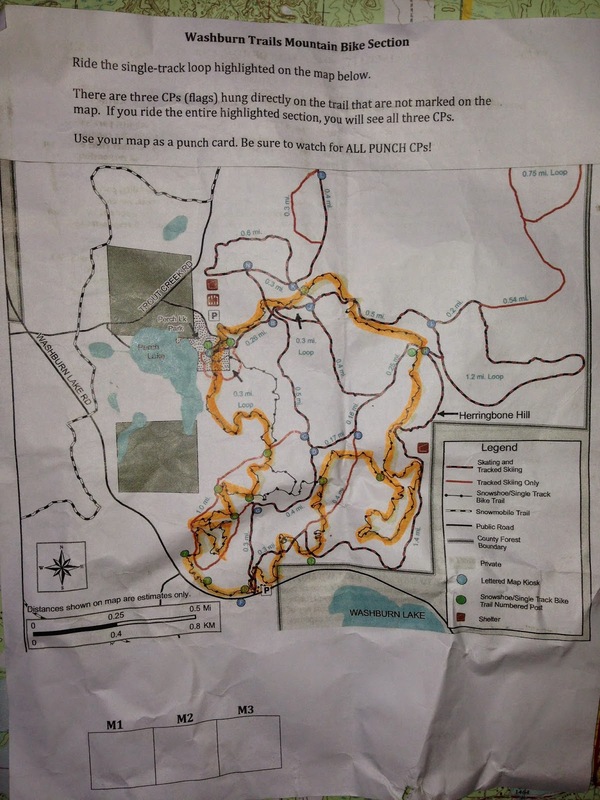 We are happy to be momentarily indoors, but that comfort will be short-lived as the race staff gives us a park trail map with instructions to ride the dedicated bike singletrack in a loop until we find 3 CP flags. This kind of riding is nerve-wracking because we are always scared we'll miss the flag in a flukey sort of way, so we hope everything as obvious as it seems. We head out into the dark rainstorm with our bikes, ready to tackle the challenge. And it's a big challenge - this trail would probably be better served by full-suspension bikes with 5 inches of travel! There are rock gardens everywhere, and with the rain making everything slick, we opt to hike-a-bike quite a bit. 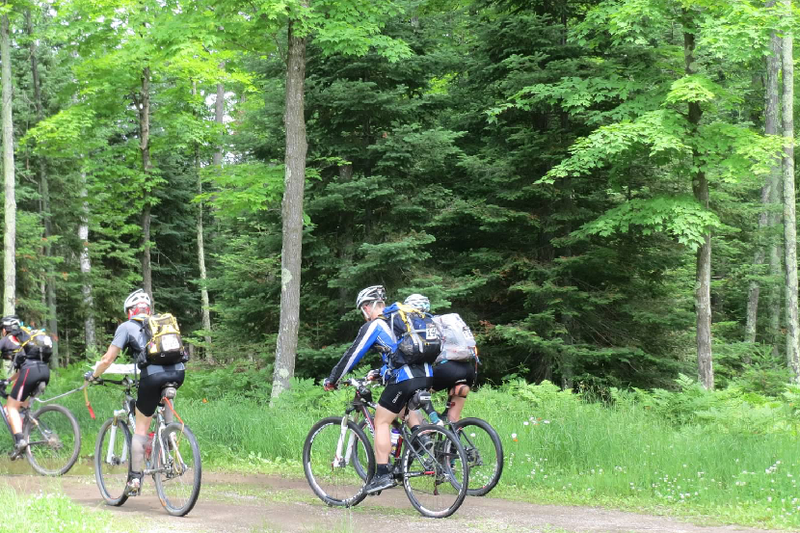 It's supremely slow-going, and we creep our way around the rain-soaked singletrack loop. The first CP comes easily enough, and then it's quite a bit of time before we find the second and third. But we finish up on an easier part of the loop and return back to TA 8/9 with our bikes and bodies intact. This is what 25 CPs looks like. Back to the TA still well before daylight, we receive the map for "the big trek". Not exactly long at 8 miles, but with 25 CPs!! Plus, this leg is rogaine-style so we can pick our route, but also have to keep track and make sure that we don't skip any of the closely-packed controls. 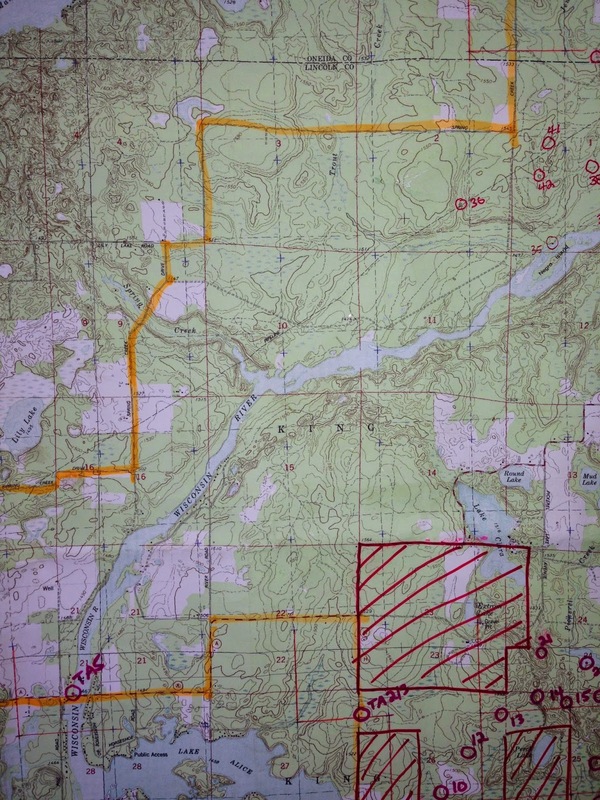 We decide to head southwest first, trying to take advantage of some of the trails shown on the map. The first two CPs go well enough with Mike leading us redline through the soaking wet woods straight to the flags. The rest of the southern controls are a fight. The subtle, thick terrain combined with the flakey trails and pre-dawn darkness combine to slow our pace considerably. We are able to sweep the south section just as dawn is breaking, but it took us at least an hour longer than planned and, if the rest of the controls go this way, we will have a hard time sweeping the entire course. It seems unthinkable, but we do some math and give ourselves time cut-offs to get back to TA 8/9. We are slightly discouraged starting northern section, but the first several CPs come quickly and we get back in a rhythm. Sweep route is back on the table. Woohoo! But that doesn't mean we're done. There's still plenty of tricky terrain to cover. It seems that no climbs are over 200 feet, but everything is so subtle and there are depressions everywhere. Just go zoom in on that map! It's crazy! 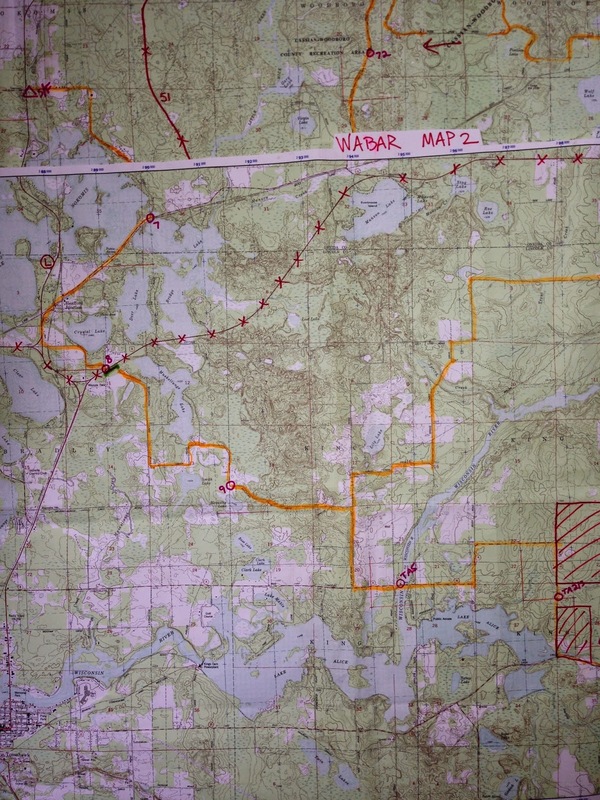 And combine that with an entire network of unmapped ski trails! Just after daybreak, we are jogging on one of the trails as it bends sharply left. Mike's in the lead, makes the turn, and then comes sprinting back at us hissing "THERE'S A BEAR!!". We all retreat a few meters and discuss what to do. We know running away isn't good, plus we have to go forward to the next control, so we all flap our arms around and start yelling at the bear. As we turn left, there's some rustling in the woods, but the bear decides to stay put, and we continue on our way, yelling and flapping for a solid 10 minutes afterwards. As we work our way through the trek, we pull together as a team really well. Whenever Mike has issues, he works with Andrei to sort out an attack plan, I keep track of clues, and Rachel keeps us speedy on the punches. We keep ticking off CPs roughly counter-clockwise in the northern section until we're on the last one. Of course it's a bugger and gives us trouble, but we eventually sort it out. No one's exactly comfortable at this point, we've all got issues; I'm dealing with chafing that I don't normally experience, but then again I haven't raced over 24hrs, mostly soaking wet, in a while. But we hold things together and jog back to TA8/9 excited to bike to the finish. Somewhere on the trek, Mike got a black eye. I did not punch him. And yes we are both stuffing our faces with food. Bike from TA9 (upper right corner) to Finish Line/Race HQ (middle left). In the last TA, we are back to "luxury racing" mode. There is leftover food from the 12hr race so we make ourselves chicken sandwiches and chow down. I use a REAL bathroom, with TP even! We take time thanking the volunteers, who have been informed and extremely encouraging all day. Since all of the previous biking has been on pavement, we're looking forward to an easy 15 mile cruise back to the finish line. Once we get out of TA, we have a nav error but Andrei picks it up and gets us back on the right road. We have some pavement but soon we turn onto a wet and sandy gravel road. The going is slow as we grind our way through the loose surface. Of COURSE Paula would save the hardest biking for last! We go back-and-forth with a solo male racer for both CP71 and CP72 and no one wants to ask him if he's got all the checkpoints. With our soggy final trek, it's entirely possible that someone could have scooted in front of us. In the end, Mike hatches a plan to sprint to the finish, so when he picks his spot, I jump on tow and we all boogie past the solo racer. Our gap holds to the finish line at Lake Nokomis City Hall and we are done! me, Andrei, Rachel, Mike at the finish line! Stubborn Mule race staff check our passport and wristbands and tell us we're the only team to clear the course so far. Sweet! We do a first round of gear sorting before driving to the off-site showers. There is a short line so we actually miss the awards ceremony back at City Hall, but when we get back, Paula makes sure that we are awarded some super awesome schwag - shirts from NAARS, jackets from USARA, plus things from the prize table and some discount cards. Amazing!! We spend the rest of the afternoon eating, quizzing Phil (Silent Chaser) about Cowboy Tough, and napping in the lawn of City Hall. Eventually we have to pack up our cars and make a very loooooong drive back to our respective states. I can't say enough how much I enjoyed 180 Adventure's Stubborn Mule 30hr. This race got EVERYTHING right. Beautiful course design, flawless logistics, terrific volunteers, and best of all...ALL CPs IN THE RIGHT SPOT, all 72 of them!! And did I mention that the boats we got to use were the nicest I have ever seen in an adventure race? They were awesome! I had a blast racing with my WABAR teammates as we ironed out the last kinks before Cowboy Tough in a few short weeks. Look for us there! I was saying the exact same thing about the roads at the end of the race...I surely wasn't loving those sandy roads. It was great seeing you guys between the MTB and big trek, and what a great race you all had. Can't wait to hear all about Cowboy Tough!